Compared to incandescent and fluorescent lighting, LEDs offer many advantages including long lifetime, higher energy efficiency, lower life cycle costs, and improved light quality. But LEDs are more than just replacements for traditional lighting solutions. They are also inherently electronic devices, and when controlled with smart dimming modules and power supplies used for smart home lighting and building lighting, LED luminaires can easily be integrated into the smart networks and digital control systems that are beginning to comprise the Internet of Things (IoT). There’s been considerable activity in the lighting industry related to IoT, and the subject was a major topic of interest at the 2018 LIGHTFAIR® International Trade Show in Chicago. 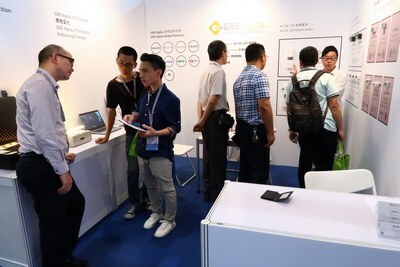 GRE Alpha displayed several products at the show including DALI dimmers that are key components in IoT-based LED lighting systems when integrated with power supplies used for smart lighting, sensors, and modules that enable WiFi dimming and control through smart networks. Since lighting is everywhere in a home or building, and since LEDs are easily integrated into digital controllers, LED luminaires can potentially offer additional functionality such as air quality monitoring, room temperature monitoring, communication with other smart devices over WiFi or power lines, and even visual light communication (VLC) to other smart devices. With the potential to serve in so many roles, LED lighting systems can serve as key components of backbone of the Internet of Things in homes, commercial buildings, and industrial applications. To guide manufacturers in developing IoT-based LED lighting solutions, the IoT-Ready Alliance, which includes leading lighting, building management, and IoT companies, introduced the first IoT interface specification for enabling future-proof intelligent buildings. Their Interface Specification V1.0 defines a socket that allows any IoT sensor or control module to connect to a luminaire or other building system. The standard includes specifications for mechanical, electrical, and software, and it allows for parts to be retrofitted or replaced on site. It is independent of network protocol, which means that IoT-compliant products can connect via wireless or wired networks to integrate with LED lighting systems. Supported networks include Thread, BLE, ZigBee, Z-Wave, Wi-Fi and IP/Ethernet networks. The IoT-Ready Alliance specification V1.0 is designed to enable rapid growth in the IoT lighting sector and to ensure smart buildings incorporate the full advantages of LED luminaires and power supplies used for smart lighting now and in the future. 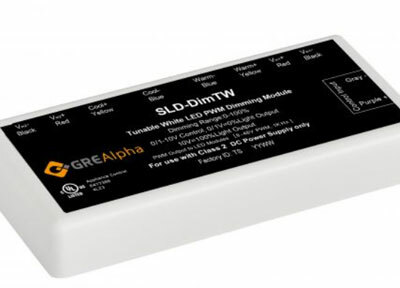 GRE Alpha is working with industry leaders and standards organizations to create next-generation IoT-integrated LED dimming modules and drivers. A current path to IoT-ready lighting solutions includes LED power supplies coupled to dimmers that conform to the Digital Addressable Lighting Interface (DALI) protocol. 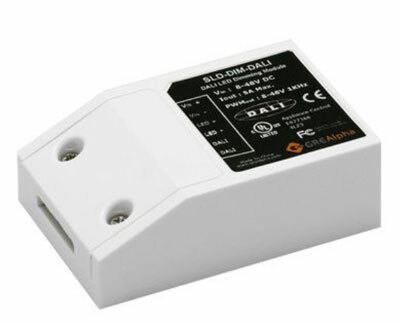 DALI dimmers such as the GRE Alpha SLD-DIM DALI dimming module provide flexibility and ease of use for smart home lighting automation projects, while the GLD-DIM module, which has an available DALI version, is a compact dimming module that serves as an add-on for constant voltage LED drivers. Both modules are fully compatible with LED power supplies used for IoT lighting and can enable network and WiFi dimming when coupled with power supplies used for smart lighting. With more than two decades of power conversion expertise and a commitment to innovation, GRE Alpha engages with industry pioneers to deliver highly efficient, installation-ready and agency-approved LED power conversion products for a wide variety of industry applications. More and more architects and building managers are understanding the benefits of lighting to our health and well-being. Studies show that lighting in office buildings can have major impacts on employee engagement and performance. With workers clocking in more hours at the office than at home each week, considering the health implications in the work environment is necessary to keep workers not only productive but also healthy. 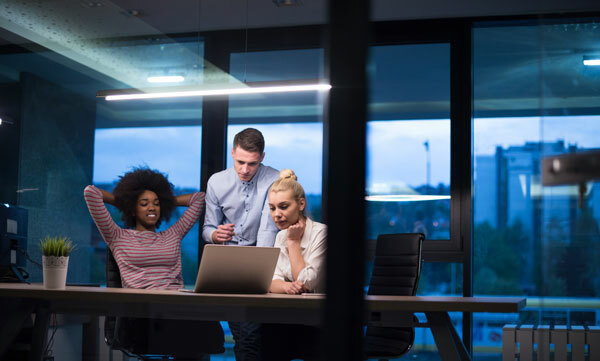 While many strategies to improve air quality and general environmental health in the workplace have been implemented in modern buildings, lighting is one strategy that can have profound affects on not only physical but also mental health of employees. One of the major ways this can be used is with tunable white lighting. Studies show that lighting in office buildings can have major impacts on employee engagement and performance. Two lines of LEDs — the most simplistic method of achieving temperature variance in white LEDs is cross dimming between a warm white LED and a cool white LED. When put side by side in an aluminum extrusion with an opal diffuser that does the color mixing, you have a very basic way to achieve tunable white lighting. 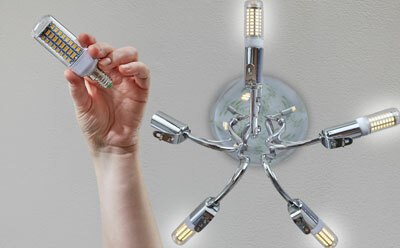 Multi chip — this type of temperature variance lighting utilizes tiny LED chips combined in one module. In this way, the color mixing occurs as the light leaves the module. The small size of this type of technology means that it can be used for several applications such as downlighting. What's key to a good tunable white lighting system is color rendering. Deciphering how well colors look when warm and cool channels are mixed together is how to effectively discern the quality of your tunable lighting system. Provide Apparent Cooling or Warming: by adjusting the coolness or warmth of the white light, a space can appear to be cooler in hotter climates and warmer in colder climates. Simulate Daylight: Studies have found that lighting has profound impacts on our health. That's why there has been such an emphasis on daylighting design in sustainable design where occupant health is considered an important element. Behavior Control and Focus: More studies have found that color temperature can also have a profound affect on attention and focus. In classroom environments, it can be used to calm students say before they begin a test or invigorate them to pay attention during a lecture. Support to Human Circadian System: One widely known fact about effect of lighting on occupant health is its role in circadian rhythms. Circadian rhythms are like an internal clock that tells our bodies when it is time to wake and when it is time to sleep. Buildings have historically had a negative affect on these natural biorhythms by providing few windows for natural daylight and harsh lighting that tricks the human body into thinking that it is day time. Tunable white lighting is being used in everything from nursing homes to treat dementia to psychiatric hospitals to curb aggressive behaviors. This method of adjusting for warm white lighting to cool white lighting to mimic outside conditions can evoke calm to alert behaviors in individuals that are serving as more gradual and holistic methods for treating mental disorders. The key to having a tunable white lighting system are the lighting control modules. The driving principle behind lighting temperatures is seamless adjustability. This means using lighting control modules that allow for gradual tuning that has a smooth temperature gradient without color distortion. Using more sophisticated LED modules is key to consistent color but lighting drivers can provide consistent temperature changes without noticeable flickers or color inconsistencies. And high-quality dimming modules can make installation simple to integrate, which is crucial when you are dealing with numerous lighting systems in a building. This can make it easier to provide lighting temperatures for interior areas of a space that depend entirely on artificial lighting. Lighting has always been a profound design element that also is crucial to functionality. Most of any enclosed space is useless unless it contains some type of lighting to illuminate it. But with most people spending upward of 80-90% of their time inside buildings, more attention is being paid to the role that lighting has in our overall health and well-being. It's known that light from the sun provides us with necessary vitamin D and regulates are circadian cycle. But now more studies are being conducted that indicate lighting has a noticeable affect on our mental health. Meaning providing the right type of lighting is essential to activate certain cognitive responses. Lighting temperature is one element that can effect these responses, and should be carefully considered in a design to trigger the right moods of occupants. HONG KONG – The 2018 Guangzhou International Lighting Exhibition is in the books. The “THINKLIGHT: Embracing Changes”-themed event featured 2,602 exhibitors from more than 140 countries. The show focused on the latest lighting applications, LED technologies, equipment and components. During a preshow interview, GRE Alpha CEO Executive Director, Richard Fong, expressed that this year’s theme means being, “dynamic, flexible and smart.” The short video elaborates on smart lighting trends with a special focus on how the Internet of Things (IoT) connectivity is changing the landscape. Several members of the GRE Alpha team joined 165,000 visitors in attendance at the Jun. 9-12 event at the China Import and Export Fair Complex in Guangzhou, China. The team expressed satisfaction with the exposure received by the products featured at the show. “Exhibit visitors showed an increased interest in Digital Addressable Lighting Interface (DALI) as a lighting management protocol in China,” said Fong. 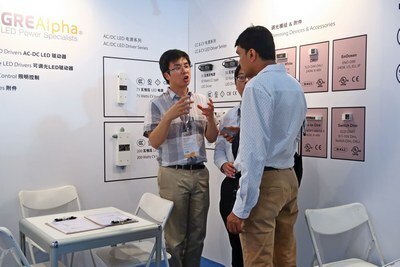 It is, therefore, no surprise that GRE Alpha’s SLD-DIM-DALI constant voltage dimming module attracted many visitors to the booth. 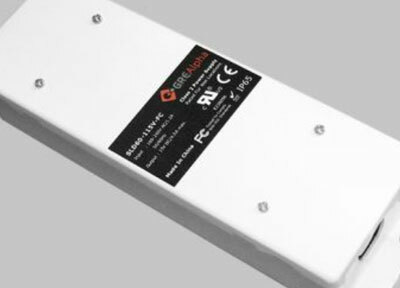 With 255 dimming levels and a wide range DC input, the SLD-DIM-DALI module is efficient and easy to install. GRE Alpha also co-launched the SLD-DIMTW constant voltage tunable white module for the CITIZEN LCN-C01B with Citizen's COB. This unique dimming module takes a 0-10V/1-10V control signal and produces a smooth, dynamic color temperature shift from 2000K to 8000K. Depending on the application situation, this plug-and-play dimming module creates eye-catching, flicker-free color temperature changing without color distortion. Not to be outdone, GRE Alpha’s EnOcean dimming modules also received a lot of attention from exhibit visitors. These modules allow for smooth, flicker-free dimming of lighting fixtures utilizing any of EnOcean’s certified Energy Harvesting Wireless Switches. The ENO-DIM module utilizes EnOcean’s proprietary communication frequencies, allowing for noise-free near-instantaneous feedback. ENO-DIM applications include architectural lighting, effect and contour lighting, general commercial illumination, warehouses, signage, strip lighting and more. The powerful combination of GRE Alpha’s dimming technology and EnOcean's self-powered sensors and switches are poised to revolutionize smart building lighting design. GRE Alpha’s XLD75 and XLD200 architectural LED drivers were also in the spotlight. These modules feature easy monitoring and installation in a rugged design suitable for harsh environment applications. With more than two decades of power conversion expertise and a commitment toward innovation, GRE Alpha engages with industry pioneers to deliver highly efficient, installation-ready and agency-approved LED power conversion products for a wide variety of industry applications. Indoor horticulture is becoming the future of agriculture faster than anyone ever imagined. The world population is growing while available land for farming is decreasing, creating the need for more sophisticated indoor food production methods. The lighting system is perhaps the most expensive and critical part of a successfully controlled agriculture environment (CEA). Deciding which technology to use is therefore very important. Indoor horticulture has been around for some years by way of greenhouses. This method allowed for some control of the growing season but still relied heavily on the sun, making it difficult to implement in areas of the globe with minimal sunlight. As lighting technologies improved, so did indoor horticulture. The greenhouse became the staple for hobbyists while commercial growers began to experiment with large-scale indoor food production and horticulture. 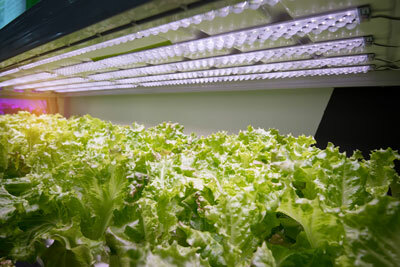 At first, growers used fluorescent tube lights to grow herbs and vegetables indoors. But the fluorescent tubes were not rugged enough for commercial applications and required frequent replacing. Compact fluorescent lights (CFL) offered an improvement to the tubes as they use less energy and emit minimal heat, thereby allowing farmers to grow more plants in less space. But just like the incandescent light that preceded fluorescent and CFL technology, growers had minimal control over the systems. High-pressure sodium (HPS) lights became the choice for most commercial indoor growers as they viewed the technology as established and dependable. However, HPS lighting systems require a substantial investment and produce a lot of heat. This means that plants must be kept at a safe distance. 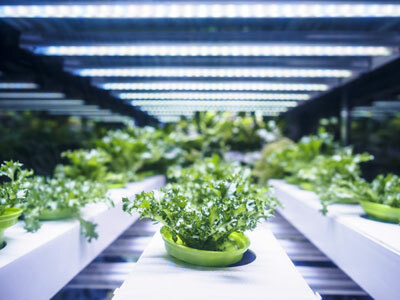 LED system manufacturers looked for ways to fill the void in the horticultural lighting industry by designing technology that is more rugged, lasts longer, and gives growers greater control over the growing environment. There are many advantages to using LED grow lights over the other available technologies. The primary benefit is lower energy costs, as much as 70 percent over the more traditional lighting technologies. LEDs also last on average 10 years as opposed to the traditional grow lights. This means a significant reduction in overall costs as frequent replacements cost time and money. Last, but not least, LED grow lights give growers complete control in specifying the wavelengths of light that reach their plants. Blue and red colors tend to be ideal for the majority of plants. This is why horticultural lighting tends to be purple as growers can select just the right amount of blue and red to create ideal growing conditions. Furthermore, the system can be programmed to provide more lighting at night when energy costs are lowest, making this the most energy-efficient grow lighting system available. Of course, an LED grow lighting system is only as good as the LED driver and other essential components that serve as the backbone of this technology. At GRE Alpha, we pride ourselves at producing the most advanced and dependable powering and lighting control solutions for horticultural and grow lighting applications. Our LED powering solutions are ideal for indoor horticulture as they are both robust and flexible. Our lighting control modules can also be added to enable complete color tuning. Our XLD and SLD Series of dual-mode, easy to install AC/DC LED drivers fit perfectly in any indoor agricultural environment. Our SLD-DIMTW tunable white dimming module enables smooth and dynamic color temperature shifts of 2000K to 8000K, allowing growers complete control of the lighting in their growing environments. While some may be discouraged by the initial investment, when all is factored in, LED grow lights offer far superior light quality, longevity, and return on investment than any other grow lighting systems available on the market. Lighting designers have been working for decades to bring intelligent automation and control to architectural and industrial lighting systems. The international adoption of the Digital Addressable Lighting Interface (DALI) in 2000 was a major step forward in this effort. DALI enables the creation and integration of scalable and smart lighting systems into intelligent networks and the Internet of Things (IoT) by standardizing the way in which components and power supplies used for IoT lighting exchange diagnostics, command, and measurement data. DALI and IoT offer designers a robust, reliable, and cost-effective protocol for creating smart next-generation lighting systems. As part of its effort to deliver the best LED power supplies and modules for smart lighting systems, GRE Alpha works as an active partner of the global DALI alliance to bring the benefits of DALI-certified dimming modules to lighting designers. 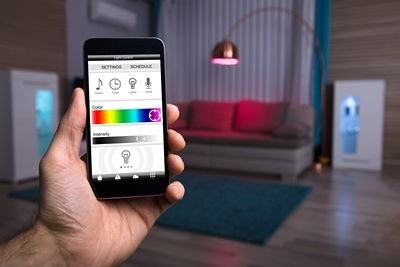 This article explains and outlines the benefits for lighting designers of using DALI dimmers and power supplies used for smart lighting for lighting solutions connected to the Internet of Things. Digital Addressable Lighting Interface (DALI) is an open protocol defined by the international standard IEC 62386 and IEC 60929. When first drafted in 2000, DALI brought lighting within the realm of digital control by enabling two-way digital communications with dimmable ballasts, transformers, relay modules and other components. Since the DALI standard was established industry wide, DALI-certified components from multiple manufacturers were compatible with each other. Components are certified as compliant with the DALI standard by the Digital Illumination Interface Alliance (DiiA), an open consortium of companies that helps to standardize and promote DALI-based lighting solutions. DALI dimming modules, ballasts, and other components make up a simple two-wire network of up to 64 individually-addressable components that can be controlled and monitored using standard commands and protocols. The protocol is compatible with the operation of a wide variety of lighting systems including LED, fluorescent, HID, and halogen. DALI devices can be programmed individually or in groups to enable a high degree of flexibility because lighting systems can, in many cases, be reconfigured in software, without the need for rewiring. DALI also allows two-way communication, which means devices can report a failure or respond to a status query. Devices can be configured to turn on and off, dim from 0-100%, and remember power-on levels, dimming levels, maximum levels, fade rates, and fade time. Two-way data transfer and power are delivered on the same pair of wires, so no separate bus cables are needed. Since the DALI protocol was established, components from many manufacturers have been certified as compliant with the IEC 62386 standard. Two of GRE Alpha’s DALI dimmers, for example, which were on display at the ERG Lighting booth at Lightfair International 2018 in Chicago. The GRE Alpha SLD-DIM DALI dimming module provides flexibility and ease of use for smart home lighting automation projects, while the GLD-DIM, which has an available DALI version, is a compact dimming module that serves as an add-on for constant voltage LED drivers. Both modules are fully compatible with LED power supplies used for IoT lighting. The Internet of Things was a key topic in workshops, product announcements, and networking events at Lightfair 2018. Introduced in late 2014, the updated DALI-2 standard, formally known as version 2 of IEC 62386 standard, is another important step towards connecting lighting systems to the Internet of Things. The updated standard was restructured to make it easier to use and fill in the gaps in the original standard. DALI-2 adds new features and commands and introduces standardization of control devices and the addition of input devices, while maintaining backwards compatibility with the original standard. The most significant change in DALI-2 is the addition of control devices including application controllers and input devices that were not included in the original standard. Application controllers are intelligent controllers that take information from input devices or other controllers and make decisions and send commands. They can operate as single masters or multi masters. Input devices, on the other hand, are simpler and include push-button switches, sliders, and sensors. They’re used in event-driven mode and provide information to the system. DALI-2 also allows an additional 64 addresses for devices such as keypads or sensors. With a total of 128 addresses on a single DALI-2 network, more flexible lighting systems can be built with less complexity and cost. The standardized DALI data model specifies the format and content of measurement and diagnostic data and the location of data in the DALI driver. This allows for seamless information exchange between products such as DALI dimmers, drivers, and other components. DiiA continues to introduce further enhancements to extend the DALI lighting protocol to enable new possibilities for lighting designers in the age of IoT. For example, DiiA is developing a specification for DALI drivers to power sensors and communications devices within luminaires, and to establish a network inside a luminaire. Other changes will enable intelligent lighting fixtures to communicate with the IoT with DALI-enabled nodes and to allow luminaires to be upgraded to the latest IoT technology. For LED lighting systems, new additions to the DALI-2 standard will also offer support for color control (RGB and temperature) and allow better reporting of energy usage and LED temperature. As with the original DALI standard, lighting equipment manufacturers must go through a rigorous process for each product to achieve DALI-2 certification. The process is managed and operated by the Digital Illumination Interface Alliance (DiiA). Only DiiA-certified products can carry the DALI and DALI-2 logo, and only DiiA members can certify their products. When selecting the best LED power supply and dimming modules, lighting designers and architects should keep in mind the many advantages of the standardized DALI protocol. DALI and DALI-2 certified lighting components offer a robust, reliable, and cost-effective approach for creating lighting systems that are more easily integrated into the IoT. By standardizing measurement and control data and protocols, DALI dimming modules and LED power supplies used for IoT lighting offer benefits such as ease of installation, flexible design, and interoperability. GRE Alpha is a member of DiiA and continually works within the alliance to develop DALI dimmers and other LED lighting components to enable advanced IoT lighting systems.